I just created this card really, really quick...it was so easy. The saying was printed, I then added colorful ribbon and rhinestones to match the ribbon. 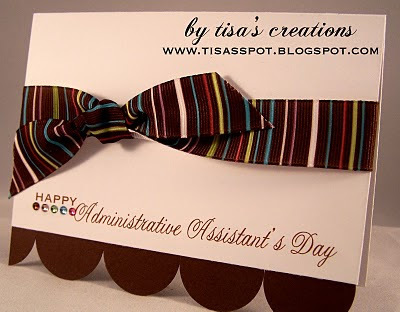 I've NEVER created an admin's day card - and I have worked as an Executive Assistant for many years...so I really can't explain that one...but today is the day. 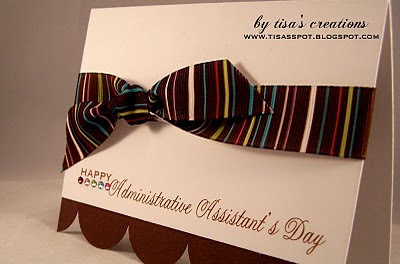 I want to say Happy Admin's Day to all of the assistants out there that have super awesome bosses (like me), and those who must deal with crazy people in the office on a daily basis. Those who have added nurse, furniture mover, copier repair person, errand runner, message taker, lost and found person, person who must find the person who left their car on running all day in the parking lot, facilities coordinator and peace maker to your resume. LOL!